The story of banking in the City of Milwaukee begins in 1836, the year that the Wisconsin Territory separated from Michigan and the year before the economic depression of 1837 caused a national crisis in banking. Newly-established banks across Wisconsin, such as the Bank of Milwaukee, failed as a result of President Andrew Jackson’s “Bank War,” promoting a massive public distrust of all banks. As a direct result, a decade later the territorial legislature created an 1848 Constitution for the nascent state that prohibited banking unless a referendum reinstituted it. In Milwaukee, however, there were several institutions created prior to statehood that managed to get around these prohibitions. First, the Marine and Fire Insurance Company in 1839 (which later became the Marine Bank) was led by Alexander Mitchell and financed by investors from his hometown in Aberdeen, Scotland, such as George Smith. Denying that it was an actual bank, this institution nevertheless served several banking functions, including issuing paper currency and accepting deposits in addition to straight forward insurance policies. Another type of financial instituion was established in 1847 as an “Exchange Brokerage.” Samuel Marshall, a Quaker who brought investors’ money with him from Pennsylvania, established what in a short time became the Marshall and Ilsley Bank or M&I. 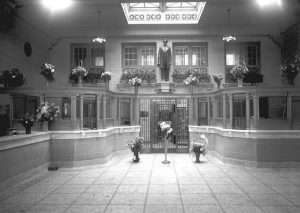 It was located on E. Water Street, right along the Milwaukee River where newcomers to the city could deposit their money (and foreign currency) for safekeeping and receive deposit certificates at the standard exchange rate set by New York banks. By the time these two institutions were well-established, Wisconsin had joined the Union and had held a referendum on banking which resulted in an 1852 law that permitted banking under controlled regulations. During the 1850s, Marine Bank, M&I, and several others were crucial in financing the beginning of Milwaukee’s era of commercial and industrial growth, lending money to nascent shipping companies, breweries, and new factories. State regulations required a set amount of capital at each institution before it could print money for local circulation. It was not until the Currency Act and the National Banking Act of 1863, signed into law by President Abraham Lincoln, that the federal government took over responsibility for printing all paper money and chartering national banks. Over the years, the state of Wisconsin repeatedly tweaked its oversight of these financial institutions. In 1868, regulatory administration was shifted from the earlier office of Wisconsin’s Bank Comptroller and, in 1903, the State Banking Department was set up to supervise the chartering and operations of state banks. In addition, the Wisconsin Bankers Association, created in 1858, took charge of upholding professional responsibilities for bank officers across the state. 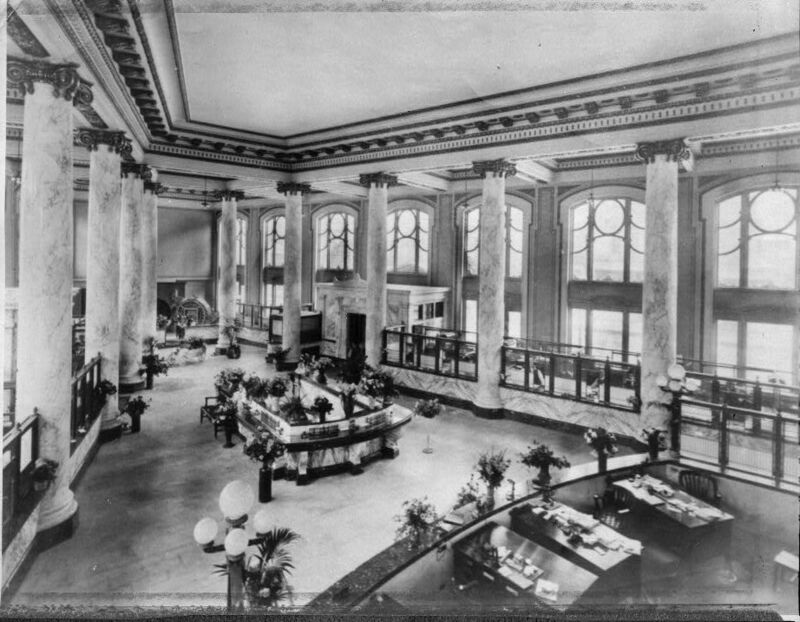 Subsequent to the Lincoln era legislation, several new banks were chartered in Milwaukee, including the Farmers and Millers Bank (which merged in 1919 with the First National and the Wisconsin National banks to create the city’s largest, the First Wisconsin National Bank) and the Second Ward Savings Bank (established by leading brewers to serve their capital needs). Then, in the Depression of 1893, many of the city’s banks had to close their doors for a time—or permanently. The subsequent Panic of 1907 then resulted in another new set of “progressive” banking regulations, and ultimately, in 1913, with the creation by Congress of the Federal Reserve System. 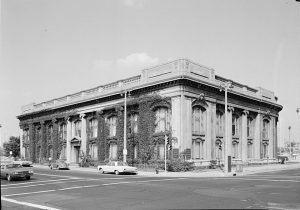 A number of new state and national banks were created in Milwaukee as the financial situation improved, including the Park Bank and the Bank of Commerce. Under the leadership of the Federal Reserve System, there was an attempt to stabilize the system of banking and stiffen the reserve requirements for deposits and credit. However, even this system failed in the onslaught of the Depression of the 1930s when thousands of banks across the country and hundreds in Wisconsin failed. All of Milwaukee’s banks had to close their doors to prevent a “run on the bank” that would have ruined them. Under the New Deal and President Franklin D. Roosevelt’s “Bank Holiday” program, all banks were closed while federal bank examiners determined their worthiness to reopen. Emerging out of this examination, banks such as the First Wisconsin, M&I, Marine, Bank Mutual, Park Bank, and others were reopened within a few days and allowed to resume business while others closed permanently. The new Federal Deposit Insurance Corporation, established in 1933, set up a national program to insure deposits and therefore restore public confidence in the safety of banks. The FDIC has continued to be successful in maintaining consumer confidence in Wisconsin and nationwide in the decades since its passage. However strong these institutions became, expansion was made difficult by the 1947 state law that prohibited branch banking. Finally, in the 1960s, that prohibition was lifted and, over the coming decades, M&I, like others, was able to acquire banks in other parts of Wisconsin, eventually becoming the state’s largest by 1993. A further change in banking laws in the 1980s and 1990s altered the rule against interstate banking and, as a consequence, several Milwaukee banks were purchased by large banking houses from New York (Chase). The pattern of local banking has virtually ceased in recent decades as the First Wisconsin has become First Star and then U.S. Bank, the Marine Bank has changed from Bank One to Chase Bank, and the M&I has been taken over by BMO-Harris. Only a few local banks remain, among them the very strong Waukesha State Bank. Today consumer banking needs are often met by savings and loans and credit unions. ^ Bayrd Still, Milwaukee, The History of a City (Madison, State Historical Society of Wisconsin, 1948), 27-29; John G. Gregory, History of Milwaukee (Chicago: S. J. Clarke Publishing Company, 1931), 1: 389; James A. Watrous, ed., Memoirs of Milwaukee County (Madison: Western Historical Association, 1909), 1: 560. ^ Alice E. Smith, George Smith’s Money (Madison: State Historical Society of Wisconsin, 1966), 20-27; Marvin J. Fruth, Log of the Marine, (Milwaukee: Bank One Corporation, 1988), 16-19. ^ Ellen D. Langill, Powered by Our Past, 150 Years of Marshall & Ilsley Bank (Milwaukee: M&I Corporation, 1997), 10-19. ^ Robert C. Nesbit, Wisconsin, A History (Madison, WI: State Historical Society of Wisconsin, University of Wisconsin Press, 1973), 234, 267-271. ^ Langill, Powered by Our Past, 40, 54-58, 64-65, 77, 78; Still, Milwaukee, 58-60, 137. ^ Langill, Powered by Our Past, 97-99. ^ Langill, Powered by Our Past, 127-131. Anderson, Theodore. A Century of Banking in Wisconsin. New York: Arno Press, 1980. Buenker, John D. The History of Wisconsin. Vol. IV, The Progressive Era, 1893-1914. Madison: State Historical Society of Wisconsin, 1998. Fruth, Marvin J. The Log of the Marine. Milwaukee: Bank One Wisconsin,1989. Langill, Ellen D. Powered by Our Past, A History of the Marshall & Ilsley Bank. Milwaukee: M&I Corporation, 1997. Nesbit, Robert C. The History of Wisconsin. Vol. III, Urbanization and Industrialization, 1873-1893. Madison: State Historical Society of Wisconsin, 1985. “Permanent Historic Designation Study Report,” First National, First Wisconsin Building, Donna Schlieman, Nominator. Milwaukee: Department of City Development, 1986. Smith, Alice E. George Smith’s Money, A Scottish Investor in America. Madison, WI: The State Historical Society of Wisconsin, 1966. Smith, Alice E. The History of Wisconsin, Vol. I, From Exploration to Statehood. Madison: The State Historical Society of Wisconsin, 1973. Still, Bayrd. Milwaukee, The History of a City. Madison, WI: The State Historical Society of Wisconsin, 1948.